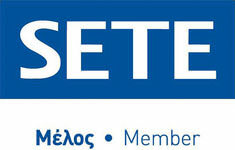 Live an authentic experience in Peloponnese. Central Peloponnese combines perfectly mountain and sea scenery, mythology and history, culture and tradition, nature and activities. We combined some of the region’s most important sites with a lot of fun, action and touring. 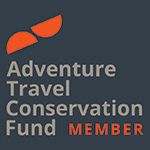 Explore historical sites and monumental trekking paths. 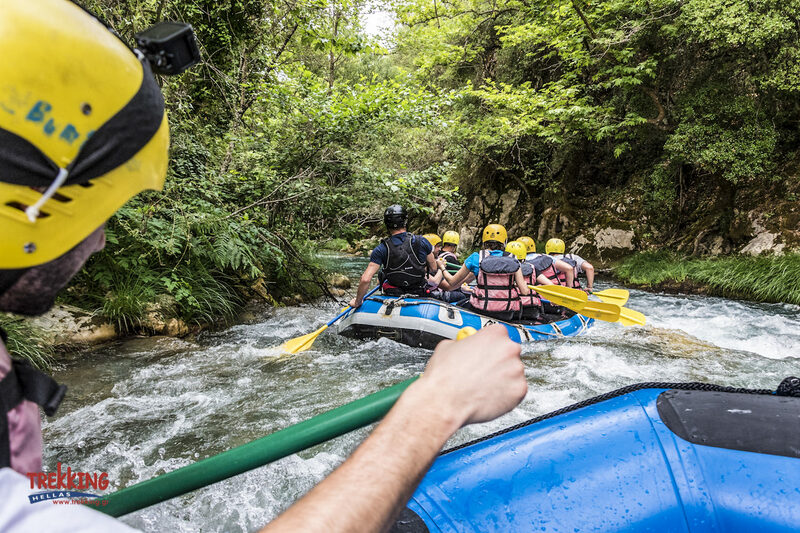 Discover the vigorous rivers and the astonishing gorges. 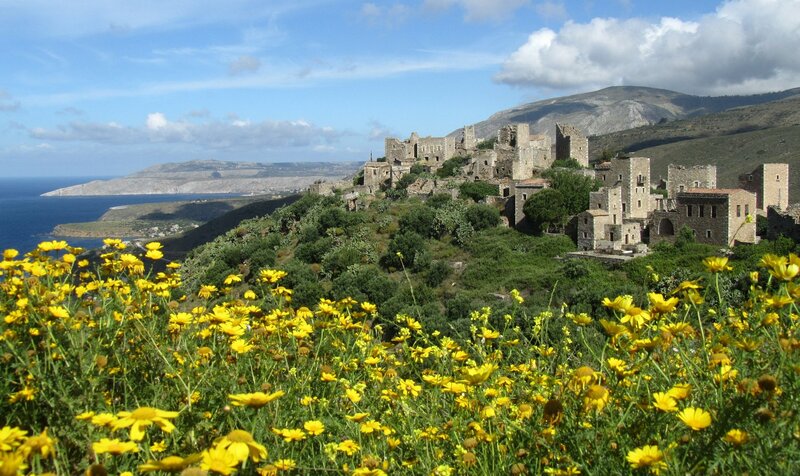 Enjoy the hidden beauties of the Peloponnese, away from the tourist masses. 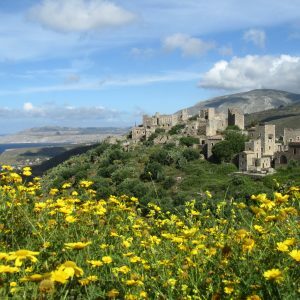 Depending on your time availability we can tailor it specifically to your needs, add or take out destinations, or combine a visit to the south of the Peloponnese or even the island of Kythera. We are leaving the lively city of Athens behind and head to Nafplio. A short stop at the Corinth Canal, the six-kilometer waterway connecting the Ionian and Aegean seas. We continue our scenic drive to Mycenae and Epidaurus. Mycenae is a historical place that first appears in the works of Homer, 9th century BCE poet. We admire the enormous Cyclopean walls – still a wonder how they were created- and enter the imposing Lions gate to the site that dates back to 1350-1200BC, wandering through the remaining ruins. Just outside the walls, we visit the Vault-shaped tombs of Lions, Aegisthus and Clytaemnestra, and the Treasury of Atreus. 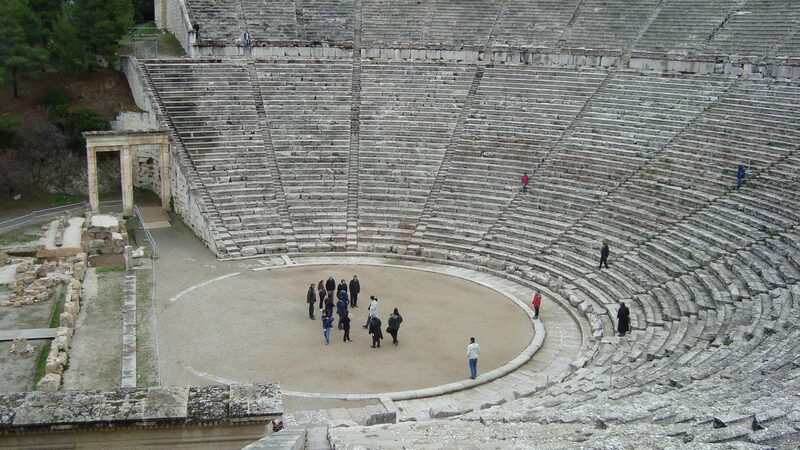 We also visit the third-century theatre of Epidaurus, one of the best-preserved classical Greek structures renowned for its superb acoustics, which is in the Unesco World Heritage list. 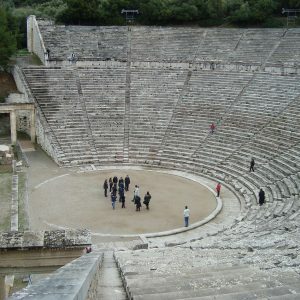 Epidaurus site was set up in a wonderful location, to honor the God of Medicine, Asklepios, son of Apollo and Coronis. Sick people came on a pilgrimage to the shrine to spend the night in the hope that Asklepios would appear in their dreams with a diagnosis and a prescription. Our day ends in Nafplion, considered one of the prettiest towns in Greece, the first capital after independence and a major port since the Bronze Age. Distance: 135 km / about 2 hours drive. 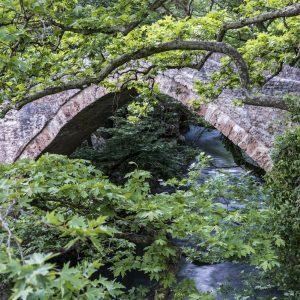 Early in the morning, we continue to a less touristy but very inspiring mountainous region in central Peloponnese, renowned for its rich in historic villages like Dimitsana, Stemnitsa and Karytaina. 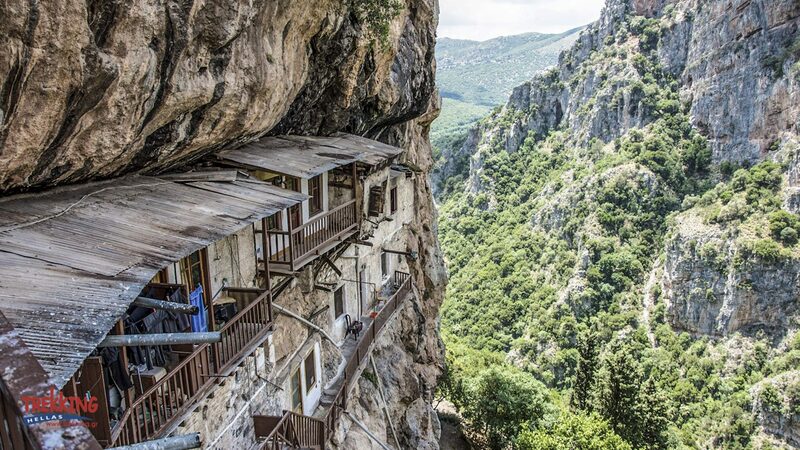 Today we hike in the inspiring Lousios Gorge. The hike offers a beautiful combination of history with nature. 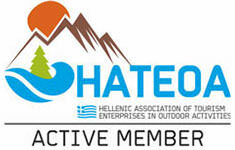 We walk amongst trails of dense vegetation going parallel and crisscrossing the Lousios River. 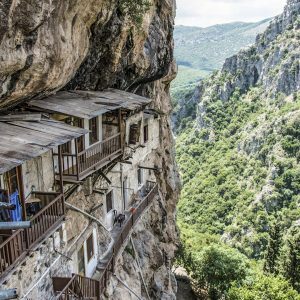 We visit monasteries that appear to be literally hanging from the cliffs and end the trek at the archaeological site of Ancient Gortys. 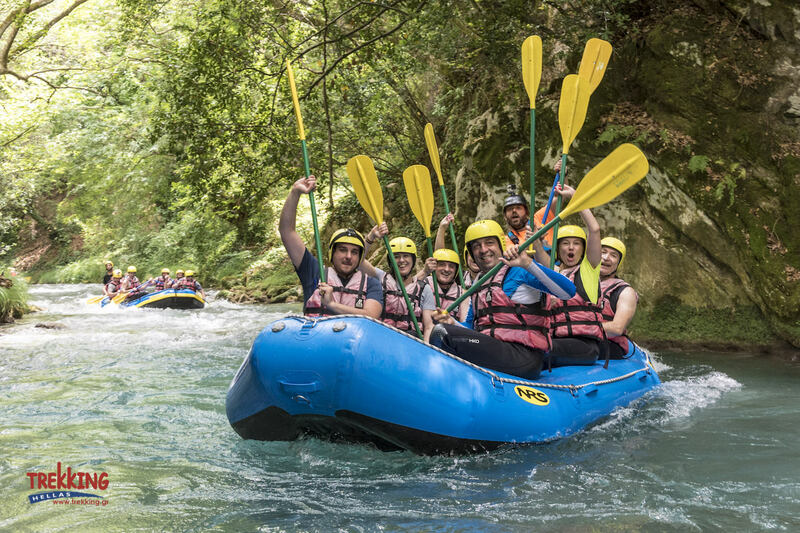 This is one of the most stirrings of all Greek sites as it is based along the rushing river known in ancient times as the Gortynios. 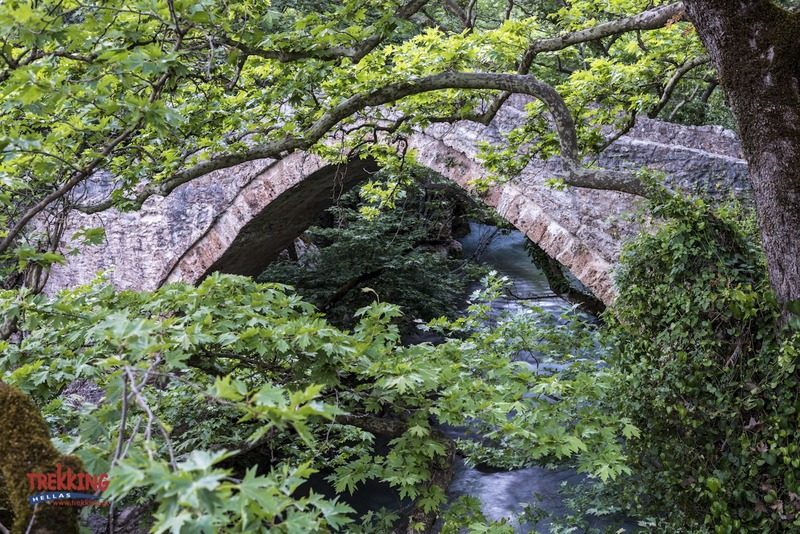 Lousios river is where Zeus the father of Olympian gods bathed after his birth, according to Pausanias the Greek traveler and geographer of the 2nd century AD. 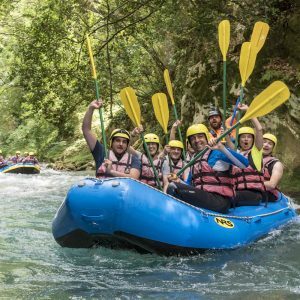 Discover a hidden natural paradise and enjoy rafting in a spectacular densely vegetated gorge and in the river’s crystal clear waters. 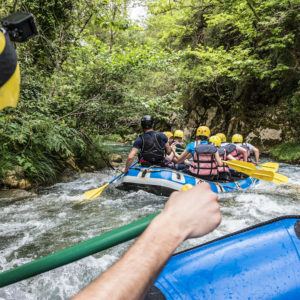 The descent is of a 2nd-3rd degree of difficulty, starting from Lousios, continuing to Alfios River, and ending to the spectacular bridge of “Koukos”. 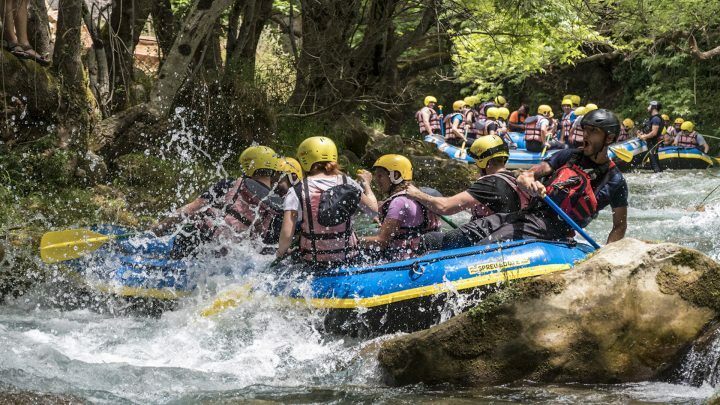 Optional activity (during summer time): River Trekking in Neda Gorge. Having enjoyed our traditional Greek lunch we continue our journey to Olympia. Distance to Olympia: 86 km / about 2 hours drive. 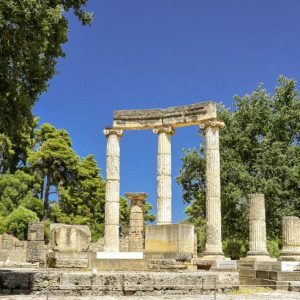 Explore the areas numerous historical sites, namely the archaeological site of Ancient Olympia, the archaeological and Olympic Games Museum, the monument of Cubertin. Afterwards, drive via west coastal road all the way to Kalamata and then to Kardamyli a picturesque tiny village. 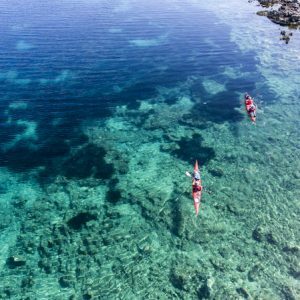 En route you can stop for swimming in the sandy beach of Kyparisiakos gulf – one of the longest sandy beaches in Greece renowned for the biggest concentration of sea turtle Caretta-caretta nests. On our way, we can also visit Ancient Messini, a less known and advertised but very impressive archaeological site. 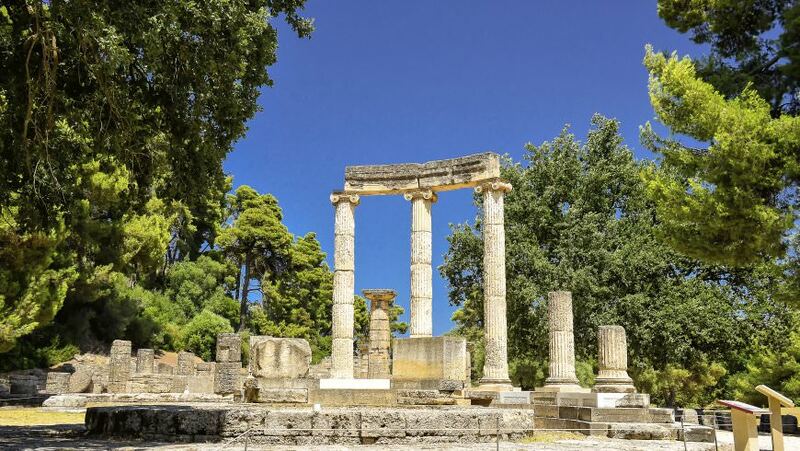 The remains of this vast ancient city are as extensive as those of Olympia and Epidavros, yet Ancient Messini receives only a fraction of their visitors. Picturesquely situated on a hillside below the village of Mavromati and still undergoing excavation, the site comprises a large theatre, an agora (marketplace), a vast Sanctuary of Asclepius and the most intact and impressive of all Ancient Greek stadiums. Distance: 160 km / about 2,5 hours drive without stops. Our trip starts from the old harbor of Kardamyli, the place we meet. 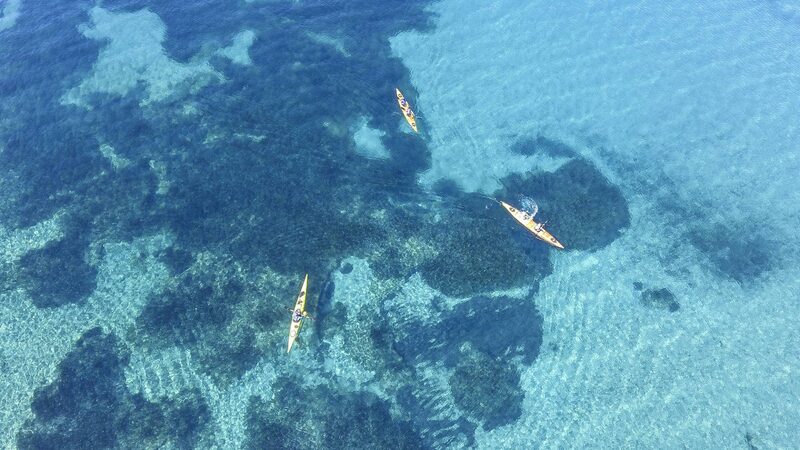 At the beginning of the activity, we attend a brief but comprehensive introduction to the basics of sea kayaking. 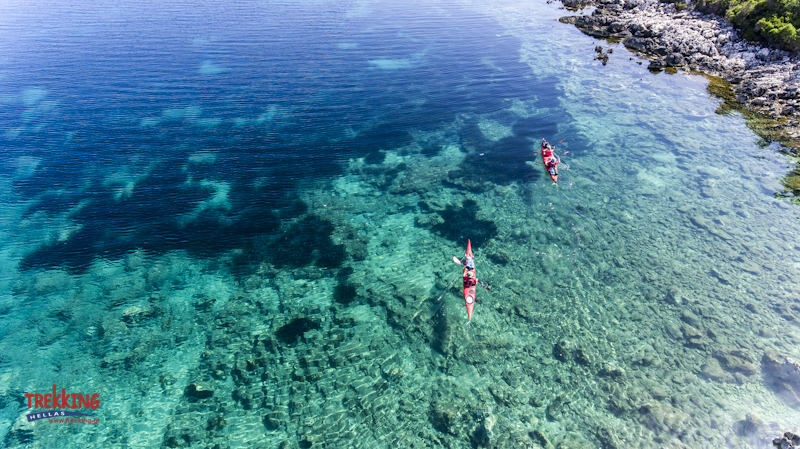 We get our kayaks and begin to enjoy an excursion where each little cove has a special surprise such as hidden caves, cliffs with spectacular formations and unique beaches with sand or pebbles such as the well-hidden beach of Foneas with the white pebbles and the sandy beach of Delfinia. Weather and time permitting, we head to Stoupa and the beach of Kalogria with its fine golden sand and turquoise waters. The beach of Kalogria is known as the beach of Zorbas, as this was the place where writer Nikos Kazantzakis met the hero of his book Zorba the Greek. Halfway we make a relaxing stop for swimming, snorkeling and a picnic with local traditional delicacies. After our activity, we travel even further in deep Mani and overnight in Limeni another beautiful sea village. 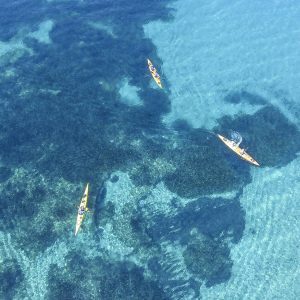 We start our day with a visit at Diros Bay where we tour the impressive Glyfada sea caves. These caves, open to the public since 1963, are rated amongst the best of their kind in the world. 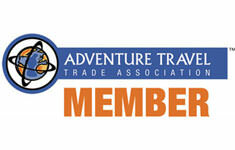 We can visit the caves by boat and admire the delicate stalactites and stalagmites. We then drive or bike towards Cape Tenaro, the southernmost point of mainland Greece. 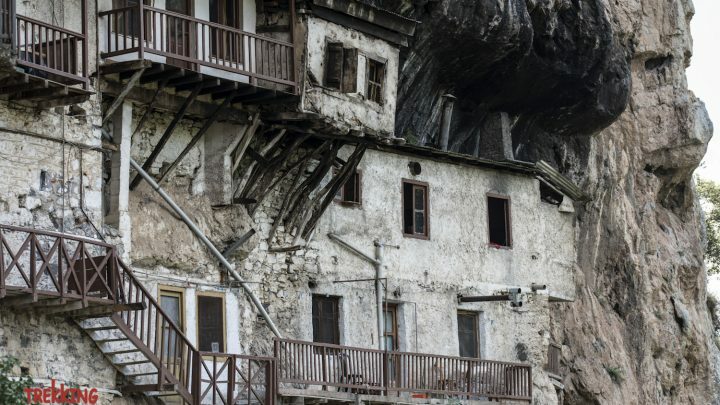 On our way, we stop for a short visit to the partially restored tower village of Vathia. The basic settlement of Vathia was formed mainly after the 18th century, flourished in the 19th and began to decline in the 20th. A little further down the coast, we start the day’s walk. A route takes us from the settlement of Kokkinoghia and along the coast to a lighthouse. At Kokkinoghia there used to be a temple to God Poseidon, but it was converted by Christians into a church. At the beginning of the path from Kokkinoghia towards Tenaro, we see a decorative mosaic dated to the 1st century AD, from the floor of a Roman villa. After 45 mins walking from Kokkinoghia, we end up the southern-most tip of mainland Greece. There we find a lighthouse. On the west of the lighthouse is a cave that Greek legend claims was the home of Hades, the god of the dead. As the southern-most tip of mainland Greece, Tenaro is famous for being on the migration path of birds headed to Africa. We can end the day with a refreshing swim. After our breakfast, we travel via the southern slopes of impressive Mt. Taygetus to Sparta and the Byzantine citadel of Mystras a fortified town in Morea (a.k.a. the Peloponnese), on Mt. Taygetus, near ancient Sparta. 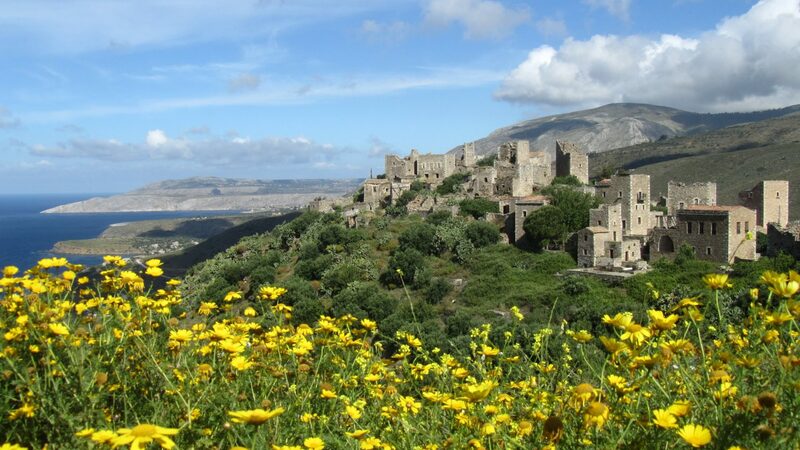 It lies approximately 8 kilometers west of the modern town of Sparti. The town of Mystras was built as an amphitheater around the fortress erected in 1249 by the prince of Achaia, William of Villehardouin. Reconquered by the Byzantines, then occupied by the Turks and the Venetians, the city was abandoned in 1832, leaving only the breathtaking medieval ruins, standing in a beautiful landscape. In 1989 the ruins, including the fortress, palace, churches, and monasteries, were named a UNESCO World Heritage Site. After finishing our visit, we head back to Athens.